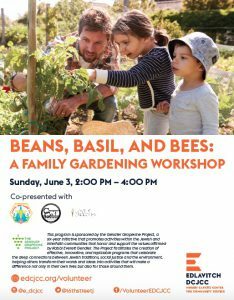 Edlavitch DC Jewish Community Center’s project, “Environmental and Food Justice Family Workshop Series” provides two family workshops about environmental and food justice initiatives in the fall 2017 and spring 2018. The first workshop was a “glean and learn” workshop and was held in September 2017, where participants travelled to a farm in Maryland to glean fruits and vegetables that would have otherwise gone to waste. The gleaned produce was donated to the Capital Area Food Bank, an EDCJCC community partner. After gleaning, families participated in a learning session delivered by EDCJCC JOFEE fellow Darya Watnick. The second program took place in spring 2018, and was a hands-on workshop focused on composting and urban gardening. 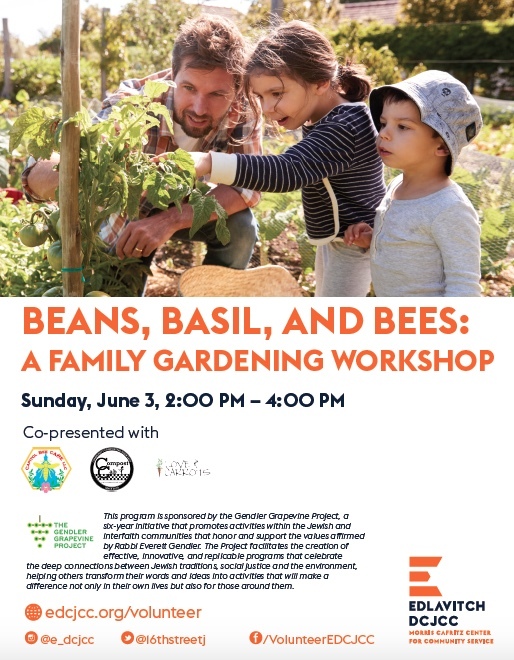 This program provided families with the tools necessary to create space for families to garden and compost at home. In partnership with several DC non-profits (i.e., DC UrbanGreens) and business leaders in the urban environmental movement (i.e., Compost Cab, Rooftop Roofs, Love and Carrots), families learned about the importance of composting and gardening. They also received supplies (e.g., a starter kit) and information on how to create their own composters and urban gardens. This workshop incorporated activities for all ages, including a compost scavenger hunt where children were given magnifying glasses and bingo cards with items, such as earthworms and bugs, to search for in their compost pile.